Several courses of the bachelor’s programs Medicine and Biomedical Sciences are taught in English and we have places available for international students. An overview of the courses and links to the online study guide are given below. Are you interested in a certain course? Make sure you register before April 1st for the first (autumn) semester. Are you interested in the biomedical science courses of the second (spring) semester, please apply before October 15th. The courses below are part of the regular curriculum of the bachelor’s programs Medicine and Biomedical Sciences. 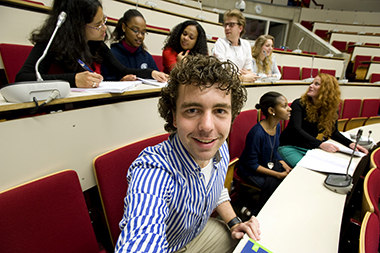 Therefore, the course work groups consist of both international and regular Dutch students. These courses are a must-follow if you are interested in a mixture of different learning types, like lectures, patient demonstrations, practicals and small work groups (max 15 people). We also expect interaction between the student and the teacher: you bring in your own cases, we use many examples from real life, and we value in-depth discussions between students and teachers. You can apply for a course if you are a bachelor student in Medicine or Biomedical Sciences and meet the other admission requirements. International students have to register through the online registration system before April 1st. You will be asked to upload a motivation letter and several other documents. Please contact the coordinator for international affairs for more information.